This exceptional antique Edwardian sterling silver centrepiece has an oval navette shaped form with a plain scrolling pedestal and knop to a swept square base. The body of the central bowl is comprised of wirework loops with a reed decorated paralleling border to the incurved rim. This hallmarked detachable bowl sits to a plain circular receiver. Each of the four original hallmarked baskets have a circular rounded form onto a plain collet foot and are embellished with further wirework loops. 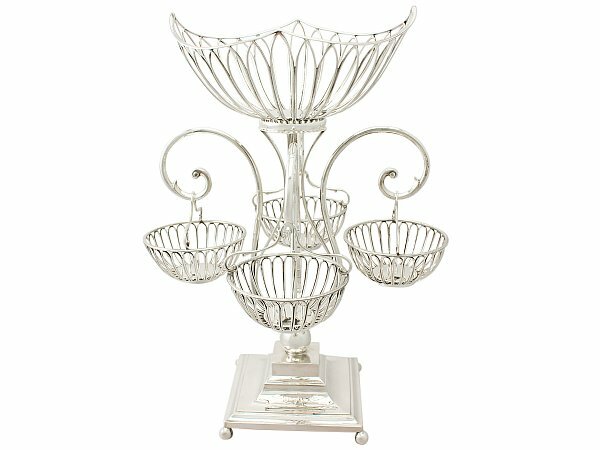 The baskets are fitted with sterling silver opposing scrolling handles and suspend from four large and impressive scrolling arms accented with leaf decorated hooks. The large globular knop to the lower portion of the pedestal surmounts a square boxed plinth and swept base, all elevated by four ball style feet. This centrepiece, crafted by George Maudsley Jackson and David Landsborough Fullerton of Josiah Williams & Co. is a highly desireable design and style; centrepieces of such a delicate form and structure are uncommon. 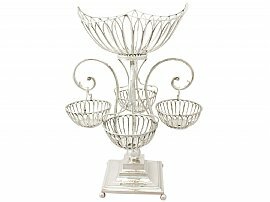 This antique silver table centrepiece is an exceptional gauge of silver, exceptional quality and in exceptional condition. Full hallmarks to the underside of each piece and surface of the base are very clear; the hallmarks to the base have wear in keeping with location but remain legible. Length of central basket 24.5cm/9.6"
Width of central basket 18cm/7.1"